Heavy storms in northern Italy have led to at least four deaths and multiple emergency rescues in some of the country's most mountainous regions, local media reported Sunday. A man was killed after being hit by lightning on Marmolada, the highest mountain of the Dolomites, Italian news agency Ansa reported Sunday. In the Friuli region, one Belgium tourist is believed to have died after a tree fell on his tent. In the Lombardy area another woman died after slipping from a wet hiking trail. 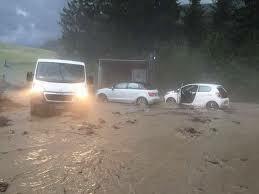 A woman also died in Cortina d'Ampezzo after a landslide buried her car, fire officials said on Saturday. Local rescue authorities spoke of "many victims" over the weekend and warned hikers to take weather alerts seriously.